"Death flies on tarnished wings." Shanks are small flying robotic drones used by the Fallen. Shanks are small floating drones employed by the Fallen as scouts, fire support or to serve as a distraction. They are propelled by a pair of vertical jet engines which allow them to both fly and hover in the air. Standard shanks are only equipped with a weak Arc-based weapon and are rather fragile in that they can be destroyed in only a few shots. Although, during Nightfall Strikes and certain Public Events, Shanks can have a Solar shield making them more difficult to dispatch. Individually they are little more than a nuisance, but they are often found in swarms or as part of a larger group of Fallen which makes them considerably more dangerous. They can also be spawned during battles with Fallen Walkers. In addition to the standard Shanks, some Fallen Houses also employ different varieties which possess different characteristics. For example, the House of Wolves utilize Repeater Shanks, which act as fire support, Exploder Shanks, which act as a kamikaze unit, and Tracer Shanks, which act as snipers. Repeater Shank—also known as a Turret Shank, it has a larger weapon and a higher rate of fire. Exploder Shank—Shank that rushes Guardians and detonates when in close proximity. Tracer Shank—Shank armed with a Wire Rifle. Employed frequently by House of Wolves and House of Dusk. Heavy Shank—Large, heavily armored Shank equipped with dual machine guns. Mainly employed by House of Dusk. Baring Dregs and Servitors, Shanks are the only enemy type to not get a Taken version. Sekris, Baron of Shanks given his unique title might be the creator of Shanks. A Guardian is engaged by a Shank. Fallen Shanks being deployed from a Devil Walker. A Shank with Devil Fallen troops. Screenshot of an Exploder Shank. Screenshot of a Repeater Shank. 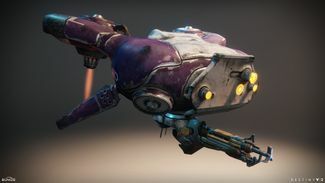 Screenshot of a Tracer Shank. A Dusk Shank on Nessus.